Geek of All Trades: "A towering figure on the culinary front"
"A towering figure on the culinary front"
I am sad today thinking of the loss of this culinary icon whom I have admired for so many years. 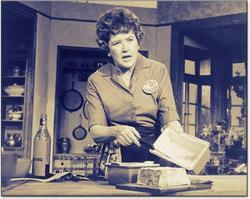 Apart from being over six feet tall, Julia Child was confident, brassy, gutsy, smart, accessible, and real. She worked for the OSS in World War II. She was the first woman inducted into the Culinary Institute Hall of Fame. Her legendary Cambridge kitchen is now in the Smithsonian. Raise a glass of Bourgogne to the memory of this great and grande dame of French cooking in America.